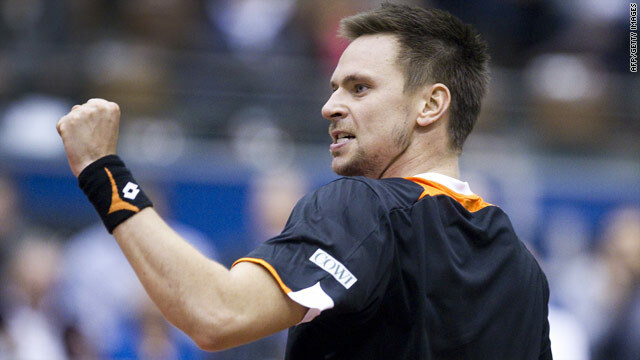 Last year's French Open finalist Robin Soderling celebrates after finally winning a match in 2010. (CNN) -- Robin Soderling came from behind to earn his first victory of 2010 on Monday, defeating Florent Serra 4-6 6-4 6-1 in the first round of the World Tennis Tournament in Rotterdam. The world No. 8, handed a wildcard entry and seeded third in the absence of injured world No. 2 Rafael Nadal, bounced back after suffering first-round defeats at the Australian Open and Chennai Open. The Swede fired 26 aces past the Frenchman, who earned only one break-point against Soderling's serve in the last two sets after winning the opener. Soderling will play Igor Sijsling in the second round after the Dutch qualifier defeated Germany's Mischa Zverev 6-7 (2-7) 6-3 7-5. Fifth seed Tommy Robredo also progressed with a 7-6 (7-4) 6-4 win over Dutch wildcard Robin Haase, and the Spanish world No. 15 will next play Florian Mayer. The German defeated world No. 37 Janko Tipsarevic of Serbia 6-3 6-7 (6-8) 7-6(8-6) in the first round. World No. 46 Andreas Seppi beat his fellow Italian, qualifier Stephane Bohli, 6-1 7-5 to set up a second-round clash with either Serbian eighth seed Viktor Troicki or Austria's Jurgen Melzer. The Dutch indoor hardcourt event is missing defending champion Andy Murray and last year's losing finalist Nadal, so world No. 3 Novak Djokovic is the top seed. The Serbian opens his account on Tuesday against Sergiy Stakhovsky of Ukraine, and could meet Robredo in the quarterfinals. World No. 6 Nikolay Davydenko is the second seed, and the Russian's first match is against Feliciano Lopez of Spain. Fourth seed Gael Monfils of France takes on Belgian Olivier Rochus in his first match.